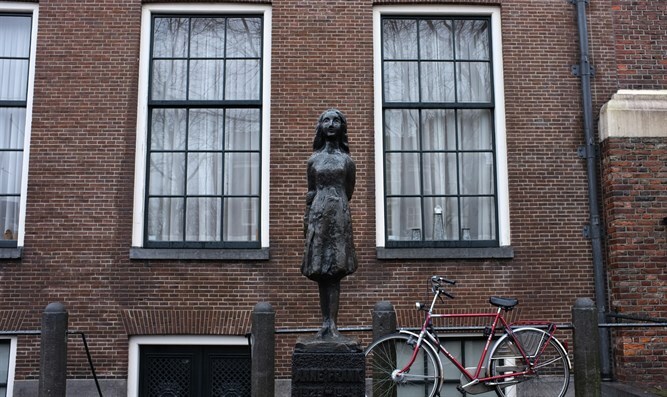 JTA - A play that ignores Anne Frank’s Jewish identity and features an unfounded assault allegation against a Jew who hid with her is generating controversy in the Netherlands. The play, which is slated to premiere on Nov. 11 in the Netherlands, is set in modern times and mentions neither the Nazis nor why they murdered Anne Frank, the teenage diarist who wrote her world-famous journal while hiding in German-occupied Amsterdam during the Holocaust. Esther Voet, the editor-in-chief of the Dutch-Jewish weekly NIW and a former leader of the CIDI watchdog on anti-Semitism, condemned the new play as “an unscrupulous falsification of history” in a scathing op-ed published Friday. Apparently, “that pesky historical context, the one about the persecution of the Jews, that had to be done with already,” she wrote about the play, which was produced by Arjen Stuurman and directed by Ilja Pfeijffer. It is titled “Achter het Huis,” a phrase that means “behind the house” and echoes the Dutch-language name that Frank gave the secret annex where she hid. Beyond the exclusion of any mention of Judaism, Nazism and the Holocaust from the play, whose dress rehearsal was attended by several critics, Voet singled out a “violent act” that is attributed in the play to Fritz Pfeffer, a Jewish dentist who lived with Anne Frank and her family and died in the Holocaust. At least one draft of the screenplay had him assaulting, possibly in a sexual manner, Margot Frank, Anne Frank’s sister, though there is no proof or an allegation that he had ever assaulted her or any other person. Voet protested how Pfeijffer for this reason “pressed his fat thumb” on Mr. Pfeffer and “made him guilty of an act of violence. Presto: Drama!” Voet also wrote that it was “abjectly tasteless.” The play is the “latest expression of abuse of Anne Frank’s memory,” wrote Voet, citing other such abuses including claims that Frank was a lesbian and her likening to Palestinian Arabs. David Barnouw, author of the 2012 book “The Anne Frank Phenomenon” and a former researcher at the Dutch Institute for War, Holocaust and Genocide Studies, told JTA over the weekend that he “did not like the play because it was over the top” after seeing a dress rehearsal earlier this week. But, he added that he does not agree with some of the heavier charges made by Voet. “I disagree with her on some points,” said Barnouw, adding he was not opposed to artists taking far-reaching license with historical truth. “The audience needs to decide whether this is acceptable, and no one else,” he said. In the dress rehearsal, the people in hiding speak of the Jews only as “our people” and of the Germans as “the enemy,” he said. The Volkskrant reported last week that Pfeijffer is facing a lawsuit for copyright infringement by the Anne Frank Fonds, the Switzerland-based organization set up by the late Otto Frank, Anne Frank’s father and sole survivor from her nuclear family, who entrusted the organization with the rights to her diary. But a spokesperson for the Anne Frank Fonds told JTA his organization “cannot confirm” this. Pfeijffer, who is also a poet, has a history of making controversial statements, including about Jews. That charge came in a column about de Winter’s decision to leave his former publisher over the publisher’s hiring of a Belgian author, Dyab Abou Jahjah. Abou Jahjah supports Hezbollah, has called for violence against Israelis and spoke of his “feeling of victory” following the 9/11 attacks. Abou Jahjah also called Antwerp, which has a large community of Orthodox Jews, the “international capital of the Zionist lobby,” according to NRC. “Abou Jahjah speaks out for oppressed Palestinians and that makes him an anti-Semite for de Winter,” Pfeijffer wrote. He identified Abou Jahjah as “a founder of the Arab European League.” The now-defunct Muslim rights group a decade ago posted on its website a caricature of Anne Frank in bed with Adolf Hitler and another caricature suggesting the Holocaust never happened, which a judge ordered removed.